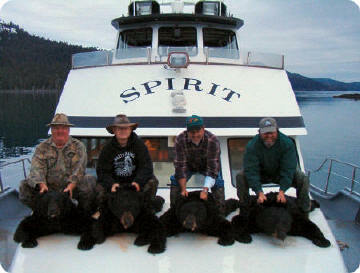 Our boats are absolutely the best way to hunt Black Bears. 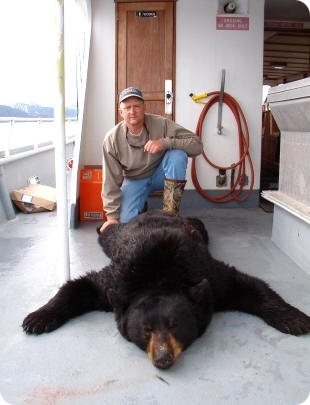 Although the hunts are unguided, you will be able to "glass" the shoreline and nearby hillsides for Black Bears from the boat or skiff. 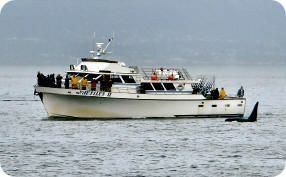 Much of the glassing is done with a coffee cup in one hand looking through the picture windows of the boat. 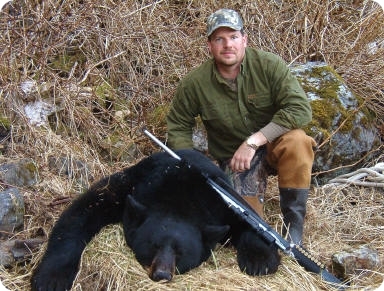 Our clients usually see between 30 and 40 Black Bears during a six-day hunt. 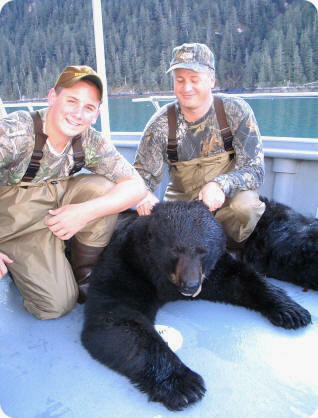 After you see the bear you are interested in we take you to shore and your stalk begins. 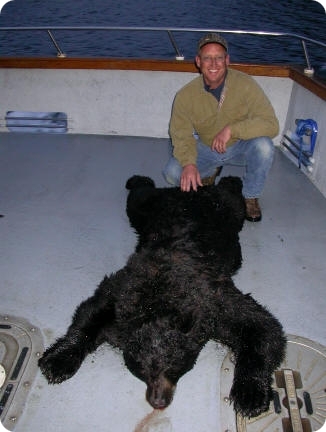 If upon closer examination of that bear you decide it is the one you want, you just need to set up for your shot. 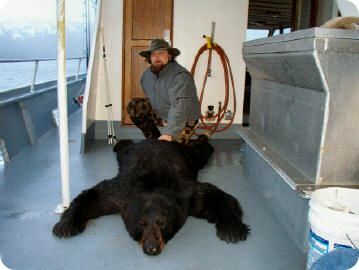 If you decide to pass on that bear, no problem, we just load back into the skiff and head for the big boat to start the process over again. 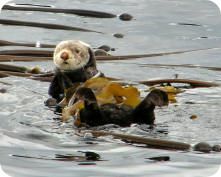 You will have ample opportunity to put in several stalks, however, you are only allowed one bear. If you decide you would rather hunt the hillsides or draws, we will give you a hand-held radio, you just need to call us when you are ready to be picked up. 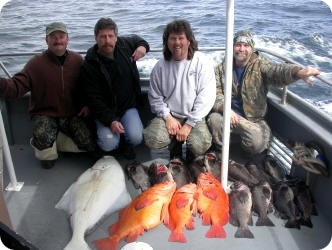 For the hunters that take their trophy early in the hunt, we have fishing available to keep you occupied. 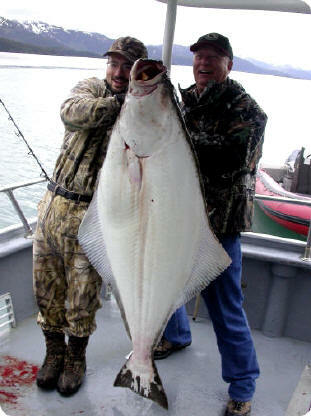 Halibut fishing is part of the hunt but hunting has the priority. 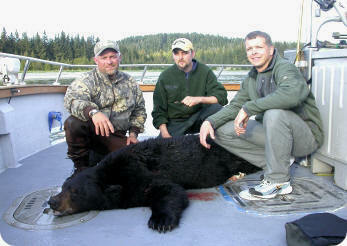 Our main fishing is usually saved for the last day or two of the hunt when everyone has filled their bear tag. 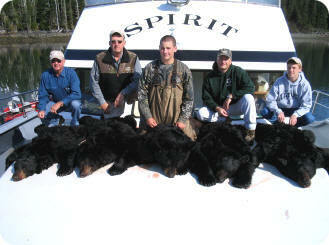 Our Black Bear hunts begin in the Homer Small Boat Harbor. You can load your gear the night before your hunt and stay on the boat if you would like or show up early the day of departure. We depart for the hunting grounds in the morning and may travel anywhere from 2-8 hours that day, depending on weather and time of season. 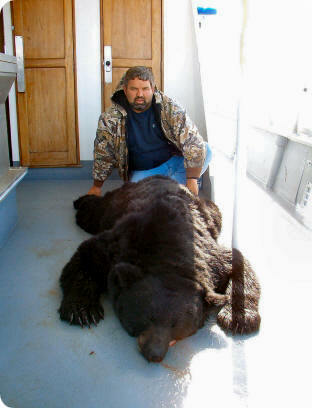 We are able to start hunting within about 2 hours out and continue to glass for bears the rest of the day. 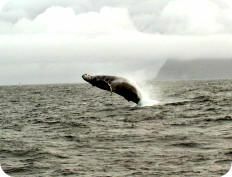 The hunting areas generally extend from Point Adams to Nuka Passage. It is our intent to put you in the most productive hunting areas possible. The success rate on this hunt is extremely high. 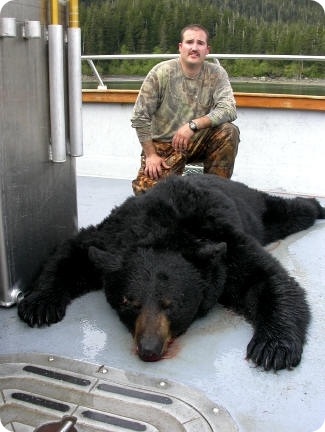 The only way our hunters have come home without bears is by passing up trophies they shouldn't have, poor shot placement, either completely missing that trophy boar, or wounding an animal they were unable to recover. 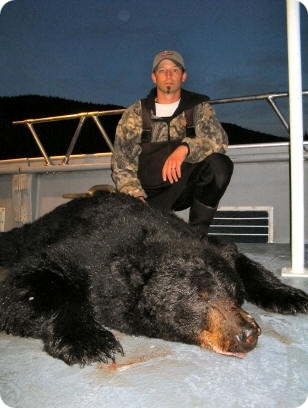 Don’t underestimate Black Bears! Sight in your rifle and know how to use it. Shorter Hunts May Be Arranged At Reduced Prices.